Venture out of the city with trips to Denmark (Forest Hill Vineyard, Wilson Inlet, & more), Cheynes Beach (in Waychinicup National Park) and Bluff Knoll (in Stirling Range National Park). Spend the 20th (Thu) exploring nature at Torndirrup National Park. Spend the 21st (Fri) exploring nature at Porongurup National Park. 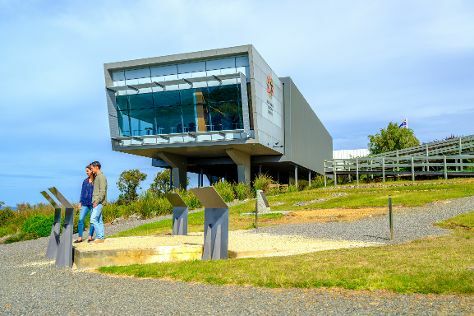 And it doesn't end there: see the interesting displays at National Anzac Centre, kick back and relax at Little Beach, don't miss a visit to Albany Wind Farm, and appreciate the history behind Desert Mounted Corps Memorial. For reviews, photos, ratings, and tourist information, use the Albany trip itinerary app . Zurich, Switzerland to Albany is an approximately 30-hour flight. Traveling from Zurich to Albany, you'll lose 7 hours due to the time zone difference. Traveling from Zurich in December, expect Albany to be much warmer, temps between 26°C and 13°C. Wrap up your sightseeing on the 23rd (Sun) early enough to drive to Pemberton. Get out of town with these interesting Pemberton side-trips: Augusta (Jewel Cave & Cape Leeuwin Lighthouse), Margaret River (Beer Tastings & Tours, Amaze'n Margaret River, & more) and Cowaramup (Mukau Giftware & Gallery, Brookwood Estate, & more). And it doesn't end there: explore the fascinating underground world of Lake Cave, kick back and relax at Yallingup Beach, take in the dramatic natural features at Canal Rocks, and get in on the family fun at Yallingup Maze. To see traveler tips, other places to visit, where to stay, and more tourist information, you can read our Pemberton online tour itinerary builder . You can drive from Albany to Pemberton in 3 hours. Alternatively, you can take a bus. Finish your sightseeing early on the 6th (Sun) so you can travel to Secret Harbour. Explore Secret Harbour's surroundings by going to The House of Honey (in Herne Hill), Yanchep (Yanchep National Park & Yanchep Lagoon Beach) and Quinns Rocks Beach (in Quinns Rocks). To see reviews, maps, photos, and other tourist information, refer to the Secret Harbour trip itinerary planner. Traveling by car from Pemberton to Secret Harbour takes 3.5 hours. In January, daily temperatures in Secret Harbour can reach 38°C, while at night they dip to 20°C. Cap off your sightseeing on the 18th (Fri) early enough to travel back home.